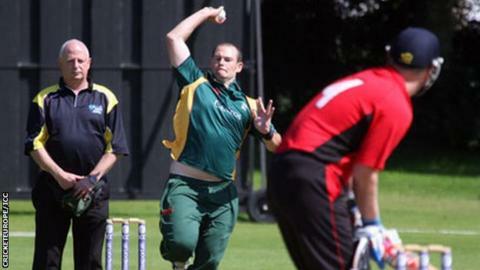 New Guernsey captain Jamie Nussbaumer is targeting qualification to the final qualifying round of the ICC World Twenty20 championships. Guernsey play in the European Division One qualifying round in Sussex in July. "It's a massive chance for us to do well and hopefully book a trip to Dubai in October and play some really good sides," Nussbaumer told BBC Guernsey. Nussbaumer, who will be assisted by new vice-captain Tim Ravenscroft, says he is delighted to have been given the job by new Guernsey director of cricket Nic Pothas. "It's massive job and one I'm very proud to do," he said. "The idea of myself and Tim being put in charge of things is that it's a long-term thing, I'm 25 and Tim's in his early 20s. "Hopefully, all things going well, we'll still be around in seven, eight or nine years time and it allows some progression in the squad as we have a very young squad at the moment." And Pothas, who only took up his role in December, says he has been impressed by what he has seen of the Cobo captain. "It's not just a decision I've taken watching him around cricket, I've watched him around his business and how he handles himself around strangers as well as his group," he said. "It's a big decision and I'd like to think it's a decision that'll span 10 to 15 years. "He'll make the position his own, become an icon within this team and I think I'll work very well with him."